Hello and welcome to Cyclingnews' live coverage of stage 20 of the Giro d'Italia from Guillestre to Sant'Anna di Vinadio - the penultimate day, the final showdown in the Alps. Hello, good morning, and a warm welcome to Cyclingnews’ live coverage of what is set to be a huge day on the 2016 Giro d’Italia. It’s the penultimate stage of the race, we’re in the Alps, it’s a short one, and there’s not a metre of flat. What’s more, the race still hangs in the balance. Yesterday was dramatic enough, but this could be another day to remember at the Giro. As you can see, we're climbing from the very start of this stage. The three main climbs are beasts - long and high - while there's also a steep final kick to the line. The riders will roll out of Guillestre at around 12.35 local time and, after a short neutral zone, racing will begin some 15 minutes later. Before we get going, a chance to catch up on yesterday's action (and boy was there action). Here's our stage 19 report, with a photo gallery, video highlights, and full results. So, climbing from the gun... that means no time to ease into the stage - it's going to be race on from KM0. That means many riders are warming up in advance on the rollers and turbo trainers. Don't worry, Vincenzo Nibali and the rest of the Astana team have warmed up. The Italian, unlikely as it may have seemed 24 hours ago, is back in with a shot at winning the Giro. With the strongest team in the race, can we expect him to take the fight to Esteban Chaves from the very start today? You have to feel for Steven Kruijswijk, and you have to admire him, too. He battled on to limit his losses yesterday after a crash saw him lose his commanding grip on the race, and today, despite injuries that include a broken rib, he's going to fight on in this race. We're a bit late in rolling out from Guillestre, but the riders are lined up and we'll be underway very shortly. This is the first climb of the day - the Col de Vars. It's 18.2km long with an average gradient of 6 per cent. That may not seem like a lot but that's partly due to a flat 2.5km section in the middle of the ascent. The riders are still behind the car waiting for the flag to drop, but when it does there'll be no shortage of attacks. Damiano Cunego is likely to go off in search of more KOM points but there'll be plenty of others who may feel they can take a stage win today. The peloton didn't let anything go for some times yesterday but today it'll be much harder for anyone to control as the road heads immediately uphill. The flag drops and racing proper begins. Team Sky's Mikel Nieve, who has already won a stage and was second yesterday, is the first to put in an acceleration. No gap for Nieve but the peloton is strung out into one long line. Cunego is right up there. This is going to put some riders in trouble straight away. Cunego goes now and Nieve takes a while to get back on terms, dragging the rest of the bunch with him. Alexander Foliforov, the Gazprom rider who won the uphill time trial last week, is the next to attack. Foliforov is caught as a group appears at the head of the race, inclduing Joe Dombrowski, Tanel Kangert, and Damiano Dunego. No attacks from the GC contenders just yet. Foliforov puts in another huge acceleration to distance the other members of this group. Stefano Pirazzi (Bardiani-CSF) is the only rider who can bridge across at the moment. Alejandro Valverde attacks the maglia rosa. Valverde has bridged to the leading group to put the pressure on Orica-GreenEdge and Astana. He's joined up with teammate Giovanni Visconti. Orica's response is to put a man in the escape. We'll get you the full names of the riders in these groups soon but it's all very fluid on the road as Astana are forced to pick up the pace on the front of the bunch. Astana bring some of these riders back - Valverde wasn't going to get away with that. Bob Jungels was also in there. Some of the members of that group have managed to forge on. It's cruel for Damiano Cunego, who is swallowed up and, such is the pace in the bunch, can't attack to chase down the leaders. Nieve is the principal threat here for the mountains classification. At the head of the race: Mikel Nieve (Team Sky), Joe Dombrowski (Cannondale), Stefan Denifl (IAM), Tanel Kangert (Astana), Damiano Cunego (Nippo Vini Fantini), Giovanni Visconti (Movistar), Darwin Atapuma (BMC), Gianluca Brambilla (Etixx-QuickStep). Diego Ulissi (Lampre-Merida), who has performed brilliantly in the mountains, sets off in pursuit. Also chasing are Rein Taaramae (Katusha) and Aleksey Rybalkin (Gazprom). The KOM standings. Cunego's blue jersey is under threat if this break stays away for most of this stage. Foliforov skips away to take the intermediate sprint on this climb, and this leading group is now on the upper slopes. 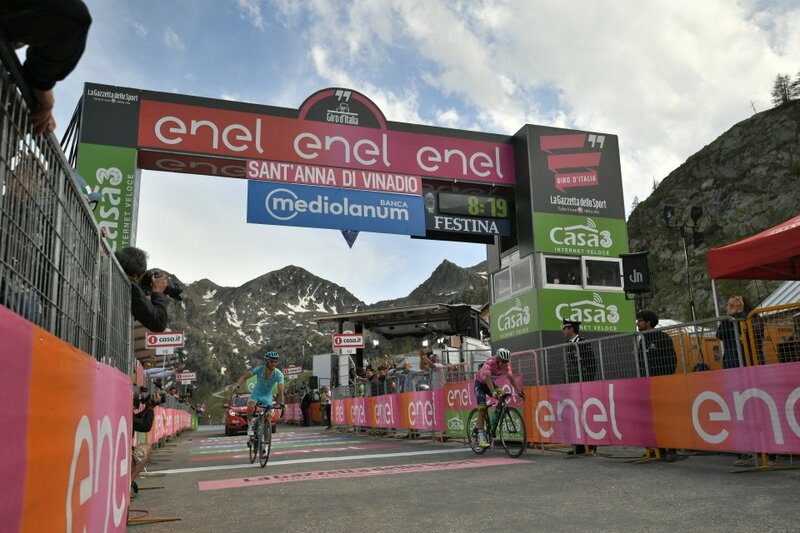 Nibali benefitted from having a teammate up the road yesterday as Michele Scarponi waited up and did a great deal of work on the way to Risoul to pile the pressure on Kruijswijk and Valverde, and tee up Nibali for the stage win. This time Nibali has Kangert up the road, and it could prove equally useful. Our eight leaders now have a lead of 5 minutes over the pink jersey group. Taaramae and Rybalkin make the junction at the head of the race, while fellow chaser Ulissi falls away. So, the leaders: Mikel Nieve (Team Sky), Joe Dombrowski (Cannondale), Stefan Denifl (IAM), Tanel Kangert (Astana), Giovanni Visconti (Movistar), Darwin Atapuma (BMC), Gianluca Brambilla (Etixx-QuickStep), Rein Taaramae (Katusha) and Aleksey Rybalkin (Gazprom). Denifl attacks in search of KOM points at the top of this first climb, and he gets them. Nieve comes across second some way behind. The leaders are now heading downhill and this is going to be a very fast descent. Gianluca Brambilla takes off from the lead group. Still all calm in the pink jersey group. Besides Valverde's short-lived attack, there hasn't been much pressure on Chaves, who still has teammates with him. Orica-GreenEdge lead down the descent in the bunch, followed by a few Astana men. Brambilla is brought back at the head of the race as the descent becomes slightly less steep. The gap has gone out to nearly eight minutes as the GC men are happy to take it relatively easy for now. Firewroks to follow, surely, on the next climb. Nieve attacks as the leading group hits the lower slopes of this climb. Here is the Col de la Bonette. It's a beast. Disturbing and distressing news from Belgium as two motorbikes have caused a big crash at the Belgium Tour. Stage 3 has been called off. Nieve is going well here and has nearly a minute already. Four Orica men on the front of the bunch. The team is looking strong today. The Astana men are up there just behind and are sure to force the issue soon. Atapuma takes matters into his own hands as Nieve continues to extend his advantage. The Colombian puts in a big, long attack. Dombrowski and Visconti are alive to it. The bunch is now 9:30 back on the head of the race. You sense Orica will be quite happy with that, as things remain calm. It can't stay that way for long. We still have a huge climb left after this, but you have to expect things to be lit up on these slopes. Foliforov joins the chase of Nieve and we now have a group of four chasing the Spaniard down. Movistar now come to the front and inject some pace. Valverde is now racing to get his podium ambitions back on track and is seemingly not afraid to take it on early. Movistar disrupt the calm in the bunch and things are really starting to break up now. Kruijswijk, third overall, had teammates but might soon be isolated. Kruijswijk has one teammate with him now, Majka also has one, as does Jungels. Needless to say, plenty of Astana men. Rojas peels off for Valverde but the Spaniard still has three men drilling it. Atapuma drives again in the chasing group but Nieve is a picture of calm and he is quietly consolidating his lead. 1:40 now for the Spaniard. It looks like Chaves is down to two teammates. As promised, he's sticking behind Nibali and Astana. We're hearing that Lotto Soudal's Stig Broeckx was the worst affected in that Belgium Tour crash. He has reportedly taken a blow to the head and has been rushed to hospital. Atapuma still going hell for leather and the breakaway group is breaking up. The thinning out process has begun in the bunch but we still await and big moves. Kruijswijk with two teammates now just behind Valverde. Behind him Majka is there with three teammates now. Astana and Orica further back. This is a long, long climb. It's not terribly steep, though, and the pace in the bunch is very steady. There's a regrouping in the breakaway's chase group as Nieve approaches the top of the climb with over a minute. With over 10 minutes on the peloton, the stage win could well be on for Nieve or one of the other breakaway men. Brambilla appears to have been distanced from the break so at the moment there's a group of 7 in pursuit of Nieve. Nieve is up past the snowline and is about to crest the Col de la Bonette, the second highest point in this Giro just 26 metres lower than yesterday's Cima Coppi - the Colle dell'Agnello. Nieve takes maximum points and moves into the lead of the mountains classification. Nieve now has 145 points. Cunego has 134, while Denifl has 108. It looks like the Spaniard will be the winner of the KOM jersey at this Giro. Tinkoff take things up in the bunch and really ramp up the pace. Rafal Majka is sitting 5th overall but looks keen to shake things up. Kruijswijk has now been isolated and the bunch, which had begun to settled down after Movistar's forcing, is now under quite some pressure. The pink jersey group now crests the Col de la Bonette. All the favourites together. Riders grab musettes on their way over. Bidons for most, gilets and even newspaper for some to stay warm on the way down. 40km of descending now for the favourites. Yes, 40. The pink jersey group is not taking it easy on this descent as Andrey Amador pushes on. Kruijswijk, who showed weakness heading downhill yesterday, is up there. Nieve is getting down calmly and, with the chase group now just 25 seconds behind, it looks like he'll be quite happy for the others to rejoin him ahead of the final climbs. Nieve looks over his shoulder and sees his former breakaway companions coming up. There's now a group of 7 at the head of the race. After the breathlessness of yesterday's action, today has been fairly subdued in comparison. There's still a monster climb coming up, though, followed by a nasty uphill finale. Brambilla is on his own but has made up quite some ground on his former breakaway companions. The team cars have all been stopped to let him through, so he must be close. Who's going to win this Giro d'Italia? No major moves for now but remember, Nibali took 51 seconds on Chaves on yesterday's final climb. The impending Colle della Lombarda here is 7km longer, with a steeper average gradient, and going up to considerably higher altitude. Then there's a tricky descent and another steep climb, so there is still potential for really hefty time gaps. Valverde picks up a copy of Italian sports newspaper Gazzetta dello Sport that one rider had shoved into his jersey to insulate himself on the way down. The Spaniard has a chuckle and asks if the Ag2r-La Mondiale rider has a copy Marca, a Spanish paper. That tells you all you need to know about the intensity of the racing at this moment in time. Brambilla makes it back into the front group. That's a great effort from the Italian, who really had to push on on the not-so-steep downhill. He may pay for it later when it comes to contesting the stage win. Orica on the front with 40km to go in the bunch. It's Amets Txurruka leading at the moment and Chaves has one other teammate near the front - it looks like Damian Howson - and possibly more further back. The leaders are coming to the bottom of this descent. There's an intermediate sprint point in Isola before the road starts to pitch uphill once more. Visconti, Kangert, Dombrowski is the order through the sprint but it's not contested. All thoughts squarely on stage honours now. Here's what the climb looks like. Nieve loses the wheel as Kangert takes it up. Brambilla is almost immediately dropped. Dombrowski attacks. The young American has looked really good at this Giro in the past week. Atapuma counters and makes it up to Dombrowski. He's determined today, the Colombian. Visconti is going after the two leaders and it's taking a really big effort to get on terms. The first move comes from the bunch, but it's not one that's relevant to the overall picture. It's Bardiani-CSF's Stefano Pirazzi who gains several bike lengths. Manuele Boaro is putting in a big shift on the front of the bunch for Rafal Majka, who hasn't been on the front point too often during this Giro but who looks keen to try something today. Majka is fifth overall, Valverde and and an injured Kruijswijk separating him from the podium. Dombrowski, Atapuma, and Visconti still have nearly 10 minutes. That should come down when the GC favourites really start to ignite the fight for the pink jersey, but it should be enough for the stage win. The pink jersey group is thinning once more but no trouble yet for any of the GC men. Pirazzi is currently embarked on the Platonic Form of chasse-patates. We're hearing that Visconti was telling his breakaway companions he has been told to wait for Valverde. He's still riding on with them, though, and that could well be a bluff and an excuse not to contribute. Astana take it up now. You sense they're the team who can do the most damage here. Fuglsang forcing the pace now. Scarponi is there in second wheel ready, as he was yesterday, to be the last man in setting NIbali up. This acceleration has absolutely shredded the pink jersey group. All the GC men still in their but it will be mano a mano pretty soon. Up the road, meanwhile, Nieve, Taaramae and Kangert almost make it up to the three leaders but Atapuma kicks on again. Nieve dropped but the other two make the bridge. Group of 5 now in the lead. Kruijswijk looks composed here. You wouldn't guess any injuries are taking their toll. He has no teammates, though. 15 riders left in the pink jersey group as Fuglsang peels off and hands over to Scarponi. Scarponi, Majka, Kruijswijk, Valverde, Chaves, Nibali, Jungels. That's the order on the road. Scarponi goes. Nibali goes with him and Chaves is immediately alive to the threat and straight on the wheel of Nibali. There's a gap behind but the others do come back together. That move gets rid of any stragglers and this is our elite group now. Eight riders in there. Uran in there at the back along with those mentioned below. Chaves said today that he just needs to keep the wheel of Nibali and he's doing a good job of it so far. The worst, though, is yet to come. Scarponi still piling on the pressure. Has to be the standout domestique of this Giro. 15km to go for the leaders and Dombrowski puts in a big attack. Atapuma, again, will not be shaken. Visconti reacts to. Kangert and Taaramae distanced. Kangert could play a role for Nibali still in this stage, so will he be told to wait up for the Astana leader? Taaramae attacks and gets a big gap. Meanwhile Kangert has sat up. Taaramae is 3km from the top of this first-category climb of the Colle della Lombarda. The GC favourites are 6km from the top. Still Scarponi on the front of the pink jersey group. Attack after attack at the head of the race as Dombrowski and Atapuma trade blows in pursuit of Taaramae. Visconti still with them. Scarponi peels off on a hairpin and the Italian goes for it. Valverde straight with him, as is Chaves. A gap has opened behind. No reaction from Kruijswijk. Majka, Jungels, Uran also distanced. Nibali is driving this now, really keen to push on. Nibali has a gap on Chaves! The Colombian has his head over his bars. The pink jersey is well and truly in play. Valverde comes off the wheel of Chaves and attacks the Colombian. The pink jersey hanging in for now but Nibali is up the road. Chaves is struggling. He has lost the wheel of Valverde. There's still a long way to go on this climb and on the stage. Big trouble. Chaves comes back to Valverde and the two are working together at the moment in a bid to bring Nibali back. Taaramae comes over the top of the Colle della Lombarda in the lead. Nibali links up with Kangert. Nice work from Astana as Nibali was seemingly losing the impetus in his attack. Uran bridges up to Chaves and Valverde. Uran said he would help Chaves, his fellow Colombian, in his fight for pink. Such allegiances, outside of team membership, are frowned upon somewhat but Chaves won't be complaining. Still waiting on time gaps but Uran is helping to close the gap on Nibali. Kangert peels off. 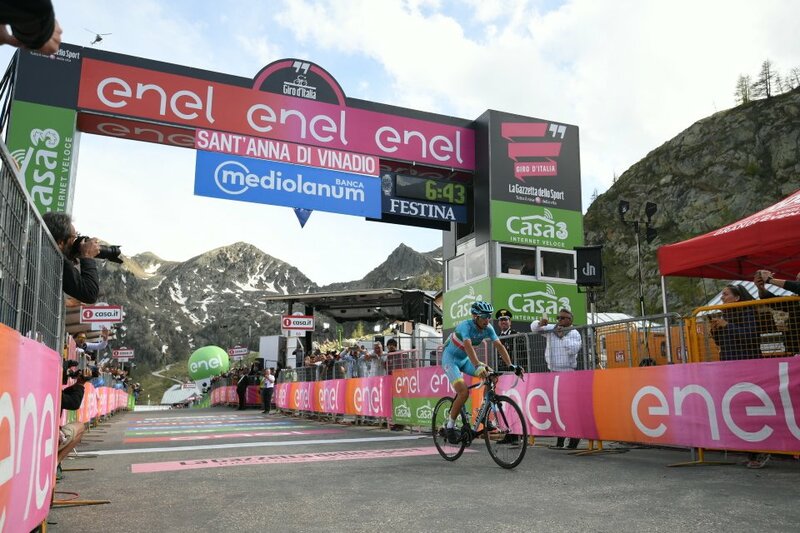 Nibali is now engaged in a solo bid for a second Giro title. He has 30 seconds. This is amazing. Nibali was dead and buried 48 hours ago. It was unthinkable that he could win this Giro. It's a very real prospect now! Chaves has lost Uran's wheel! The race leader is in big difficulty. Valverde is pushing on here, with Uran on his wheel. He could even be thinking about second place here with Chaves under such pressure. The other members of the GC group - Jungels and Majka, with Scarponi - catch Chaves. Nibali crests the climb with a lead of 55 seconds. That makes him the virtual maglia rosa - the overall leader on the road. They're climbing again at the head of the race. Atapuma has dropped Dombrowski but it looks like Taaramae is heading for the stage win. The main story (sorry Rein), however, is happening further back, and a resurgent Nibali is swooping down this descent with its gentle bends with grace. The descent becomes technical and there must be hearts in the mouths of all in the Astana camp. Nibali is giving it everything but is making no mistake so far. Atapuma is closing in on Taaramae in the final couple of hundred metres. The Estonian struggles up the steep final gradients, crosses the line with arm aloft, and earns a consolation for Katusha after Ilnur Zakarin crashed out of the race yesterday. Nibali comes off the descent and starts to climb. Atapuma comes across for second. This is a steep final climb and Nibali must press on. He has over a minute and this is looking good for him. Remember, Chaves led by 44 seconds at the start of the day. The tifosi are going wild on this climb as Nibali comes through the tunnel of fans and noise. What an amazing story this is. Nibali is slowing up here as Valverde is coming back. It doesn't look like Chaves is making up enough ground at this moment in time, though. Nibali comes into the final couple of hundred metres. Valverde comes over just 10 seconds down. Uran with him. Kruijswijk is suffering up this climb and Chaves is on his wheel. He can't give anything more. Jungels and Majka next home. Brambilla and Kruijswijk now. Chaves comes over now, well over a minute back. As if to rub salt in the wounds, Scarponi punches the line as he crosses right next to the crestfallen Colombian. That has to be one of the most remarkable comebacks this sport has seen in recent years. Valverde's performance on that final climb sees him move up onto the overall podium at the expense of Kruijswijk. Here's Chaves crossing the line. "I don't know if it's my best win, I also won a stage in the Vuelta, but a dream comes true when you win a stage in the Giro. "It was my personal target. When Zakarin crashed yesterday, I was really scared for him. It happened at 70-80kph. I was really scared he'd lose his life. I turned around to see, and when I saw that he sat up I realized he survived. It was really hard morale-wise to continue the race. "This morning I didn't feel very good, I caught the breakaway very late at the top of the climb, and it was really difficult. Once we crossed 2000m, it suited me - yesterday was the same. I've stayed here for training camp three times, and I knew if I survived in the front when we got to 2000m nobody could beat me. I know the reason - I stayed six weeks in altitude training camp - I could get a Colombian passport maybe." Nibali looks like he can barely believe what's happened as he waits backstage at the podium. We can't either. 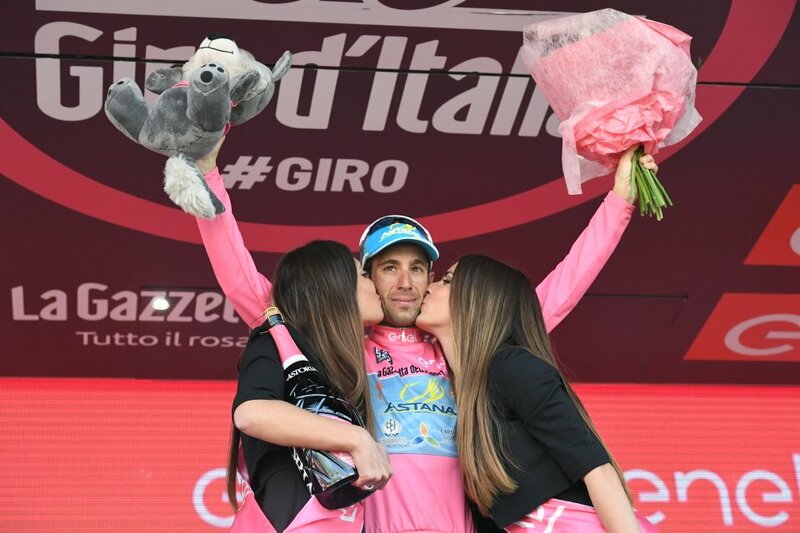 He emerges onto the podium to crack open the champagne and can lap up the adulation after what has been a highly pressurised Giro for the Italian. "I thought maybe everything was lost but also maybe that it still wasn’t over," says Vincenzo Nibali. "The last week can change and I thought something could happen. "I’m very headstrong, I never give up. Last year at the Tour I had bad days but I always try and come back. "It was a crazy Giro. A difficult, exhausting one for me. I started as the favourite and felt all the pressure. I had a lot of pressure on my shoudlers but I’ve put on this great show, so I’m happy." Orica-GreenEdge DS Matt White now talks to Eurosport. "Esteban gave it everything. Nibali has had a very strong 2 days. We're still very proud of Esteban; he did all he could and that's all we can ask of him. Here's the new top 10 overall. Remember, this is very unlikely to change on the final stage to Turin tomorrow, so this should be our final GC at this year's Giro. So, Rigoberto Uran jumps above Amador into 7th, but the real big mover there is Darwin Atapuma, second on today's stage after being part of the break. That seems him jump up into 9th overall. Kanstantin Siutsou hangs onto a top 10 finish but Domenico Pozzovivo has another sub-par day and drops out. And here is Nibali back in the maglia rosa for the first time since his he won this race three years ago. Time to hear now from Esteban Chaves. The ever-smiely Colombian was understandably downbeat after losing the pink jersey but did nevertheless remain philosophical. “I’m tired but that's life. It is only a bike race. I tried and did the best I could. The team did the best they could. I’m here, I’m happy, I did my best, I tried and this is the beginning for me. “I’m OK [health-wise]. I don’t have excuses. I didn’t have the legs and that is normal. You need strength to do this. It was one race of 80 hours and 3,000km and there are no excuses. The only simple answer is that I had no legs. Want to re-live that memorable stage? Here are our highlights. Nibali is currently at the written press conference. We'll bring you all the news from there very shortly. Here's our collection of flash reactions from the main protagonists, including Nibali, Chaves, and Taaramae. That's it from us, and from an extraordinary day's racing. Italy's hero, down and out, comes roaring back to win the Giro. What a story. We'll bring you all the news and reaction from Sant'Anna di Vinadio, so keep your eyes on Cyclingnews. We'll be back live tomorrow to wave goodbye to this Giro on the final stage to Turin - we hope you'll join us again.